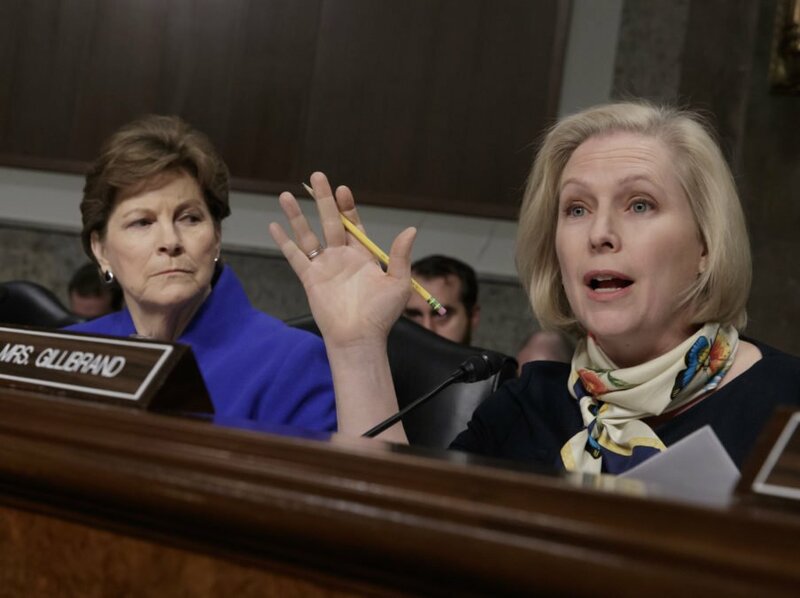 During a Senate Armed Services Committee hearing Thursday, Sen. Kirsten Gillibrand, D-N.Y., challenged the commandant of the Marine Corps for not taking sexual assault and harassment in the military more seriously. Out of concern for victimized service members and veterans, Gillibrand’s office confirmed after the hearing that the Military Justice Improvement Act will be reintroduced. The bill would block military commanders from being able to decide whether or not to prosecute service members involved in sexual assault cases, and move the decision-making power out of the chain of command. Gillibrand first tried to pass the legislation in 2013 and again in 2014; it was filibustered and failed. During Thursday’s Armed Services Committee hearing, Gillibrand questioned why punishment hasn’t been more severe for the Marines identified as having participated in the Marines United scandal, in which veterans and active duty service members shared naked photos of fellow servicewomen without their consent. “If you’re not taking these crimes seriously as an enormous disruption of good order and discipline, I fear that it’s not going to change behavior,” Gillibrand said to the commandant of the Marine Corps, Gen. Robert Neller. The bill’s reintroduction comes on the heels of the Marines United scandal, which has prompted multiple congressional hearings regarding online sexual harassment and abuse by service members and the 418-0 passage of the PRIVATE Act in the House of Representatives. PRIVATE would criminalize under the Uniform Code of Military Justice the non-consensual sharing by service members of explicit images. U.S. Rep. Martha McSally, R-Ariz., introduced PRIVATE on April 6, 2017 in direct response to the Marines United photo scandal. U.S. Rep. Jackie Speier, D-Calif., and 100 other representatives co-signed the bill, with a wide showing of bipartisan support. During 40 minutes of debate about that legislation, both representatives expressed their outrage about Marines United and past instances of similar sexually harassing online behavior by service members. Since Reveal and The War Horse broke the Marines United photo scandal on March 4, Speier has been a vocal advocate for the women whose photographs were shared without their consent on a Google Drive shared within the closed Facebook group called Marines United. The women were depicted in various stages of undress in many of the photographs, which were sorted in folders. Some were labeled by rank and duty station. The day after it passed the House, PRIVATE was referred to the Senate Armed Services Committee, where Gillibrand is a member. Like Speier, Gillibrand is a champion of women in the military and fiercely devoted to combatting sexual assault and harassment in the armed forces. In mid-March, less than two weeks after the Marines United photo scandal came to light, the Senate Armed Services Committee called the commandant of the Marine Corps to testify. Gillibrand challenged him during questioning. PRIVATE will likely be rolled into the National Defense Authorization Act, according to Speier’s office. Gillibrand’s new version of her bill will also likely be added into the defense bill, said a member of her staff. However, neither has a retroactive clause, so no matter their fate, they will not affect the outcomes for service members involved in the Marines United scandal. Anna Hiatt is a former Editorial Director for The War Horse.